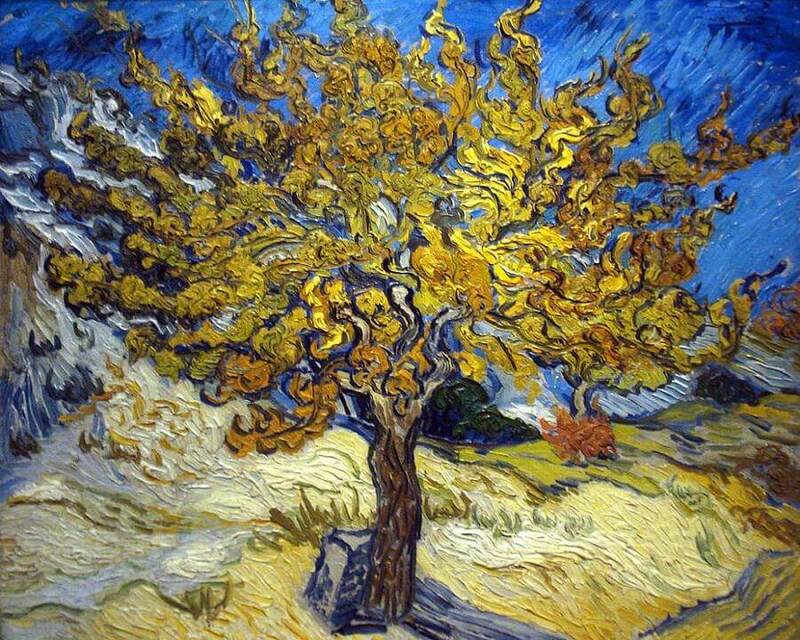 Van Gogh painted The Mulberry Tree in Autumn in October of 1889 less than a year before he would die. Like most of his art, it was done during a period of highs and lows painted during a time of great self-awareness and yet surrounded by chaos. Following a fight with his fellow artist Gauguin, during which the famous ear incident occurred, Van Gogh went to stay at the Saint Paul Asylum in Saint-Remy. He was there for about a year, from May 1889 to May 1890. After the incident in Arles, his mental state declined. He became paranoid thinking people were trying to poison him. While at Saint-Remy he wrote to his brother Theo about his state of mind, his new works, and the people around him. In the letters he acknowledges that he has been in a bad place mentally, but that he feels he is getting better. Seeing all the other patients with similar issues made him feel like he was not alone. 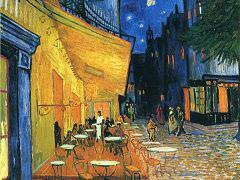 The constant in Van Gogh's life was painting, and he continued it during his stay at the asylum. 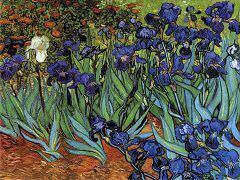 He painted all aspects of his life: the doctors, the hallways, the flowers in the gardens, the wheat fields, and the trees. The Mulberry Tree shows a tree from the garden of the asylum. It is centered on the canvas and is growing alone from a rocky hillside. The ground is made up of short quick brushstrokes of white and pale browns. It creates a strong contrast to the dark green and brown of the tree trunk. To the right, you see more greens, indicating trees and growth in the distance. The leaves of the tree make up the majority of the painting, orange against the complementary color of the blue sky. 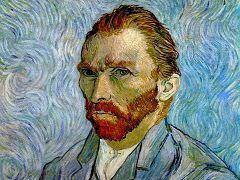 It is that "superb autumn" that gave Vincent the bright orange leaves to paint. 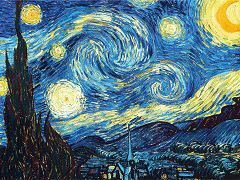 The ground and sky are made up of mostly straight diagonal brushstrokes, while the tree leaves are made up of curling spirals of orange and black, sometimes done with the handle of his brush. 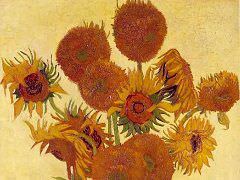 Van Gogh reveled in the textural richness of oil paint. Called 'Impasto,' his application of the paint is so heavy in The Mulberry Tree in Autumn that it appears nearly three-dimensional. We cannot discern individual autumn leaves, for the tree limbs are like twisting yellow tentacles. The fiery branches reach upward and are framed by a brilliant blue sky created from thick, short strokes of blue paint. The space surrounding the tree is rendered with a dynamism that echoes the tree's electric energy. 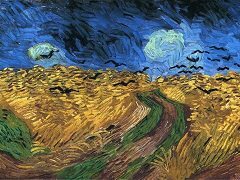 Short, thick brush strokes of lighter yellow, with intermittent strokes of green, light brown, and white constitute the rocky field described in van Gogh's letter. There is no human presence here, but the box which leans against the brown tree trunk suggests that the land has been or will be worked and harvested. In The Mulberry Tree in Autumn, an ordinary tree is painted in an extraordinary way. 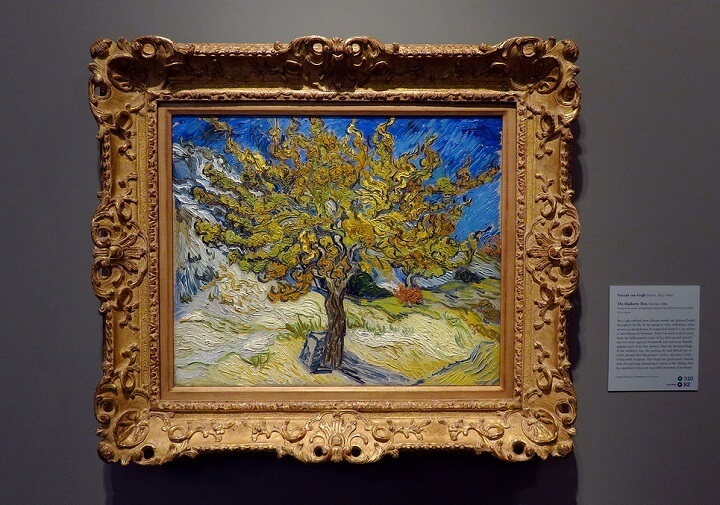 While it attests to van Gogh's keen observation of the tree and its natural surroundings, this painting is no mere record of sheer visual observation. 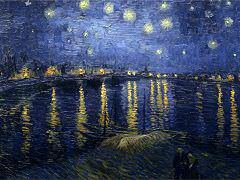 Rather, van Gogh's vibrant color and vigorous brush strokes express his passionate feelings about what he saw. 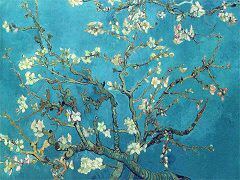 This painting was so important to van Gogh that he wrote about it three times in letters to his brother and sister, commenting that he believed it was the best of his mulberry tree paintings.